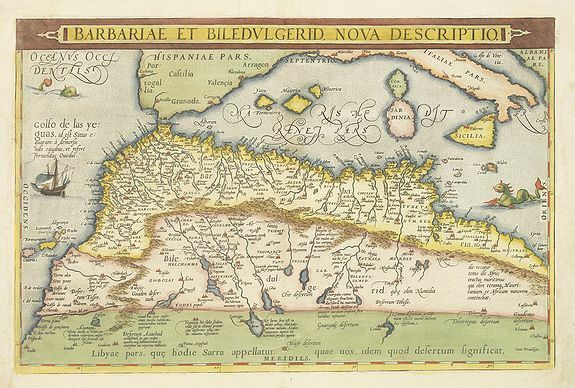 ORTELIUS -Barbariae et Biledulgerid, nova descriptio. ORTELIUS, A. - Barbariae et Biledulgerid, nova descriptio. Barbariae et Biledulgerid, nova descriptio. - ORTELIUS, A. Title : Barbariae et Biledulgerid, nova descriptio.. Size : 12.8 x 19.5 inches. / 32.6 x 49.6 cm. Description :North-West Africa. Koeman speculated: In view of the important trading relationship between Antwerp and Africa, it is not impossible that the original was a manuscript map of Portuguese or Venetian origin. In this map, Ortelius gives a number of details found on no other printed map of the period . Condition : French text on verso.